Another failed pick up line at the gym today. David: Bah, what are some “successful” pickup lines? 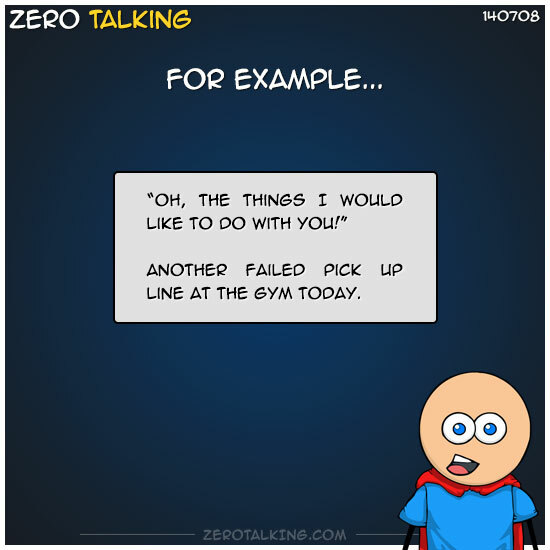 Zero: Successful pick lines are not really pickup lines. They are stated authentically in context of a particular situation. And it’s not so much what you say as how you say it. Research indicates that we don’t pick up so much on the first line a stranger says to us, as much as how they say it. It takes a second to register. And by that time, the person has likely already decided whether they want to talk to you or not. And in many cases, a woman has already decided if you are the sort of person she would sleep with in those first few minutes. TLDR: Successful pickup lines are not lines. Be authentic. Janene: True but i give a guy a chance and hear what he has to say. maybe I’m too picky because I can’t seem to find the right one. Zero: How someone looks and carries themselves (confidence can make up somewhat for lack of good looks) can also make a HUGE impact. possible for someone to fumble over their words in a silly, potentially disrespectful way, and still make a connection. Self-deprecating humor and the ability to make someone laugh (set them as ease) really helps. Charm goes along way, so long as it’s authentic and doesn’t come across as deceptive, manipulative, or overly smooth. But staring at someone like a psycho, whistling, calling, or otherwise treating someone like an object isn’t going to help.